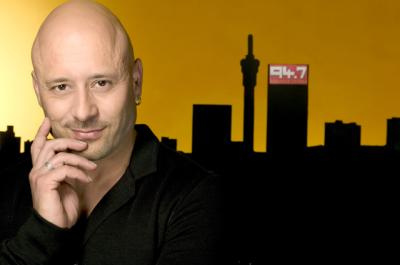 With his distinctive bald head, warm personality and easy-going demeanor, Mark Pilgrim is one of South Africa’s best-known radio and TV personalities. This multi-award winning presenter has spent over 20 years entertaining millions of listeners and viewers. When not on-air, Mark spends a lot of his time in studio, recording voice-overs for commercials, AV presentations and IVR lines. He is also one of South Africa’s most experienced Master of Ceremonies and has hosted hundreds of corporate events over the past two decades. 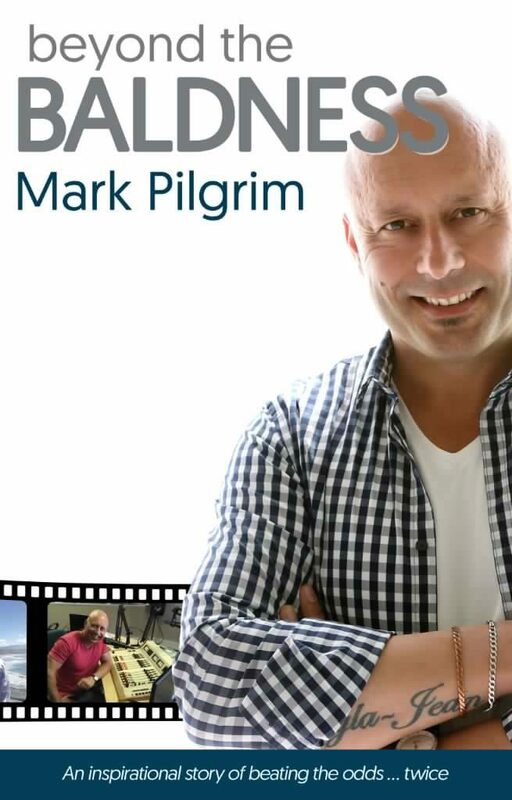 Despite all of the above, Mark still found time to pen his first book, Beyond the Baldness, which released in December. Published by Tracey McDonald Publishers, Beyond the Baldness is an inspirational autobiographical book, telling the exceptional story of how surviving not one, but two, life-threatening illnesses inspires Mark to chase his dreams. Mark is a cancer survivor. At the age of 18 he was diagnosed with stage 3 testicular cancer, which spread to his lungs and kidneys. Then, on the 14th July 2008, Mark suffered a sudden and severe heart attack. Despite these near-fatal events, Mark lived to tell the tale. And what a tale it is! Melissa Delport caught up with this father of two to find out more. Mark, first and foremost, I have to ask. The baldness… is it voluntary, the result of treatment, or a simple luck-out in the genetics lottery? I initially lost my hair when I was undergoing chemotherapy. When it grew back, instead of my thick bushy locks, it landed up being quite wispy. So I decided to keep it off and it’s become my daily reminder of what I went through many years ago. A friend saw a picture of me with hair from when I was still at school and joked that it looked like I was wearing a helmet. I have been bald for more than half my life now. I couldn’t imagine having hair again, or buying shampoo. You were born and raised in Kent, England, until the age of 9, and your father and brother still reside in the United Kingdom. How did you come to first set foot on South African Soil? My mum was South African (grew up in Muizenberg) and met my dad while he was part of the Royal Navy, docked in SA. She followed him back to the UK and that’s how I came about being a pommie. My mum always wanted to come back to SA. You were diagnosed at the age of 18 with stage 3 testicular cancer. At that age, most teens are worrying about girls and sneaking beers out of their parents’ fridge. How alienated were you from your peers and how did you cope with the weight of your diagnosis? It was the very fear of something being wrong with my nether region that stopped me from telling anyone for weeks, as I was too embarrassed to have to show my mum I had a nut the size of an avocado pear. During that time of denial I didn’t realise the cancer was being left alone to spread through to other parts of my body, eventually landing up in my lungs and kidneys as well. I’ve always been a bit of a loner, and only having been in Johannesburg for just over a year while at WITS, I never had a big social circle at the time of diagnosis. It was a tough period in my life. I was living in the lounge of my mum’s one bedroomed flat in Hillbrow thinking I was dying. It really sucked. You graduated from Wits with a B.Com in Industrial Psychology and Business Economics before going on to become a consumer researcher. The science of psychology deals with all aspects of the human experience, but specifically that of the mind. How large a role do you think the mind plays over the body in surviving a disease such as cancer? On the wall of the oncology ward (Ward 495 at Joburg Gen) they had a framed quote which read “In believing you’ll be cured is in itself a step towards recovery”. Your head has to be in the right space in order to endure chemotherapy. During your eight-year-stint in research, you became the Johannesburg Chairman of the SA Marketing Research Association. No doubt you were exceptionally good at your job! What prompted the career change? I was always good at the left brain stuff. Accounting and mathematics came naturally to me, but I always wanted to be a radio deejay. After eight years of auditioning I landed up on 5FM and held down both careers for two years before moving into entertainment full time. In 2008, you suffered a sudden and severe heart attack. I believe you were in your doctor’s rooms at the time. Do you think the availability of immediate medical attention saved your life? Without a doubt, receiving immediate medical attention saved my life. Even with the doctors administering meds while waiting for the ambulance I still suffered permanent damage to the heart muscle and now take chronic meds to keep it beating correctly. You are, without a doubt, one of SA’s most beloved deejays. You have hosted no less than 10 radio shows. In 2012 you won the MTN Radio Award for Best Commercial Music Show in South Africa, and in 2015 the MTN Radio Award for Best Community Weekend Radio Show in South Africa. Why do you think you have been so successful in this industry? First of all, I love the purity of radio and I think it comes across on air. I don’t do radio to get publicity in a magazine, I do it because I love the intimacy of chatting to someone even though I’m not really there. Also, I think that listeners pick up the integrity of my personality. I don’t go by a fake name and “stage persona”. I’m just me. You have hosted numerous prime time television shows over the years, including Big Brother South Africa on MNET, new moves on eTV and Face2Face on SABC2. In 2008 you hosted the country’s biggest ever television game show, the Power of 10 on MNET. Do you have a favourite and why? Big Brother will always be my favourite. When we started the show we had no idea how huge it would become. It landed up being the show that everyone watched and talked about. From a production point of view it was massive. I had seven cameras on me that were always moving around (and I had to know which one to talk to at different times in the show). The crowds were so energetic I had to have two earpieces in my ears just to hear the cues from my director. 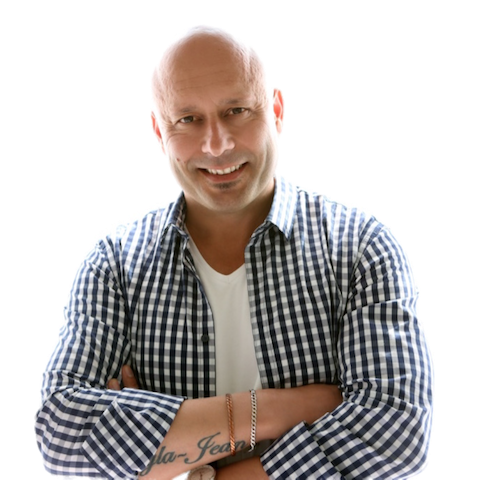 You are well-known not only for your many achievements but also for your motivational speaking. What is the single most important message you want to impart on your audience? Early detection can save your life. If you pick up a lump or other kind of anomaly, go have it checked as you may stop something from becoming worse. You have survived two life-threatening illnesses. How has this changed the way you think about life and death? It’s all about family. I love my job(s), but the only things really important to me are my wife and two daughters. When I depart from this earth I simply want to be remembered as the best dad ever. You married Nicole, the self-confessed love of your life in July 2007, on a tropical beach in Mauritius, but you met when you were doing a voice over for the company that she was working at. Apparently overachieving runs in the Pilgrim household, as Nicole now runs the company! Do you still do voice-overs for her and does she ever give you a hard time? Yep, I still do a lot of voice overs for the company. Technology has changed the way we do things now though and all the voice work I do is from my home studio so I never go to the office and see Nicole in “work mode”! In 2010 you welcomed your first daughter, Tayla-Jean into the world. Your second daughter, Alyssa, was born in June 2012. How has becoming a father changed your perception of life and your priorities? My girls are everything to me. I thought I would be a “best friend” kind of dad, but have turned out to be the disciplinarian. Sometimes the way my girls squabble I am less of a Dad and more of a referee. Parenting is the most rewarding and also most difficult job! From 2013 to early 2016 you were a columnist for South Africa’s Living and Loving magazine, writing a monthly column about parenting from a dads’ perspective. Was this your first introduction to creative writing and do you think it prepared you for writing Beyond the Baldness? It probably started about two years before the column when I began my online blog. I would just waffle about whatever was on my mind. My style was very informal and I think that’s how the autobiography landed up being so personal in its delivery as well. It was simply me chatting away… on paper (okay, computer screen). Writing an autobiographical book is an emotional journey for any author, but can also be cathartic. How did you feel, writing about such difficult experiences, and did it take a lot out of you? In life you often have general flashbacks to significant events, but writing the book meant I was reliving intimate details of what happened. The hardest part to write about was when my mum passed away and I had to tell my 8-year-old brother that she was gone. It felt like it had just happened all over again and more than once I had to stop writing to compose myself. Ultimately, what message do you want readers to take away from this book? Don’t just follow your dreams in life … chase them. Whether it be in the work place or personal life, you need to embrace your goals. Benjamin Franklin once said “Some people die at 25 and are only buried at 75.” Make sure this does not apply to you. Beyond the Baldness is published by Tracey McDonald Publishers and is available at all leading book stores and as an eBook on Amazon now.